A few weeks back, I did a post on sharpening kitchen knives. It was then I realized that I have been using the wrong cutting boards all these years. See the cutting board on top? That is made from bamboo. The cutting board on the bottom? Tempered glass, which is a big no-no for cutting as it dulls your knives. 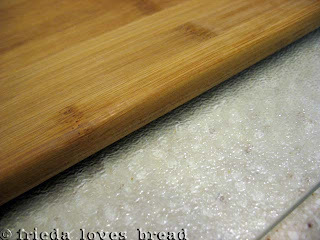 HERE is a great site that compares different cutting boards, listing the advantages/disadvantages of each. I got a set of three Kitchen Aid cutting boards for around $15 with a coupon at Costco. I figured that was a good price to try a bamboo cutting board and keep my knives sharper longer. You can find this set at Amazon HERE. I like the idea of using a bamboo product, which is a renewable source. They do require a periodic monthly "seasoning" just like traditional wood. To season the board, first clean it with soap and water (do not immerse or put in the dishwasher). Dry it off with a towel and let it air dry. 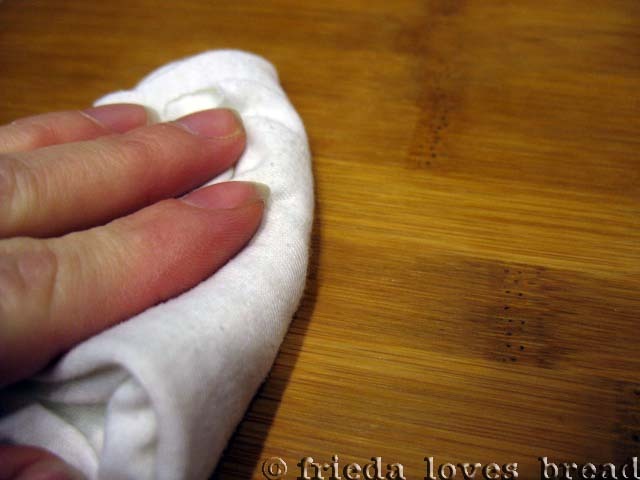 When it is dry, put some food grade mineral oil on the board and wipe it with a soft cloth. 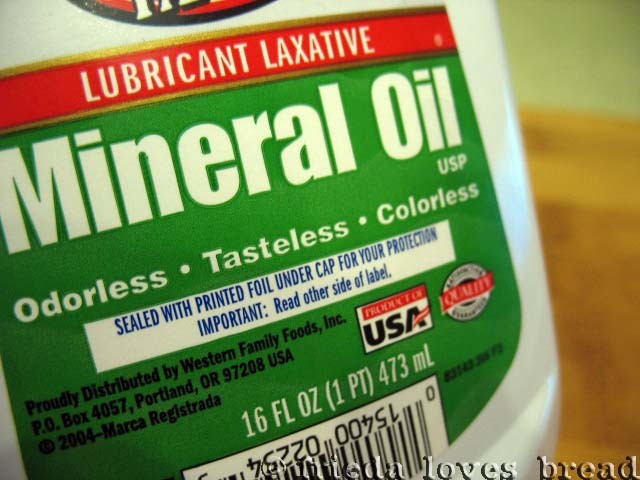 After a couple of hours, get a clean cloth and wipe off any excess mineral oil. I prefer to use a plastic cutting board with raw meats, as I can throw these into the dishwasher. If you cut raw meat on a wooden or bamboo board, you will need to wash it immediately and use a bleach solution of 1 teaspoon of bleach to 1 quart of water to rinse the board. Bleach can be very drying on a bamboo or wooden board, and you will need to "season" it more often. Do not use the bamboo board as a trivet for hot pans, as it will dry out the board and a dry board is prone to cracking and splinting. As I use my bamboo cutting boards more and more, I will let you know how they last. I've had bamboo cutting boards for almost four years and I've never seasoned them (didn't know I should!) and they still look great. I've been really happy with them. Good tips for cutting boards. I, too, prefer plastic for the ease of washing, but I use my wooden one when cutting cooked meat so the juices spill into the grooves instead of on the counter. I never thought to use mineral oil on it. Now I know why it looks cracked and worn! !